It&apos;s the first day of October, and if you aren&apos;t from Columbus, you should know - that means pumpkins are all over the place! Not just decorating porches and waiting to be picked in pumpkin patches - but in food and drinks all over the city. 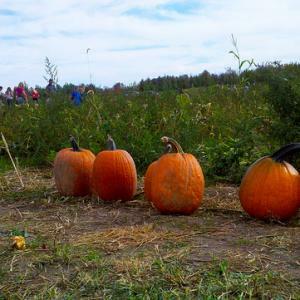 Here are a few places in town where pumpkin is elevated beyond the traditional pumpkin pie. On the sweeter side, check out Johnson&apos;s Real Ice Cream&apos;s pumpkin ice cream. Sugardaddies Sumptuous Sweeties has a seasonal Harvest Blondie that combines pumpkin with walnuts, 5-spice and chocolate - with an apricot-cardamom swirl. Explorer&apos;s Club usually serves up something simply called Pumpkin Dessert - a delightful cross between a pumpkin pie and the best pudding you&apos;ve ever eaten. Of course, I have to mention Sassafras Bakery&apos;s Bourbon Pumpkin Tart. There is way more going on here than in our average pumpkin pie. Check ahead to make sure there&apos;s one waiting for you - these sell quick! On the savory side, Spagio serves up an incredible pumpkin soup that&apos;s hearty yet healthy. It&apos;s garnished with pumpkin seeds and creme fraiche. Cafe Kabul serves Afghan cuisine, and often has pumpkin sauteed with mild spices on its menu with time of year. The Harvest Salad at Dewey&apos;s Pizza is garnished with figs, smoked bacon and pumpkin seeds. To top all this off, KOBO, serves up the Pumpkin Bomb - a combination of Pumking beer, whipped cream vodka and Goldschlagger. Perfect to go along with a rock show there. What&apos;s your favorite food or drink in Columbus that shines a light on pumpkin?